The Resist technique is a favorite among papercrafters. 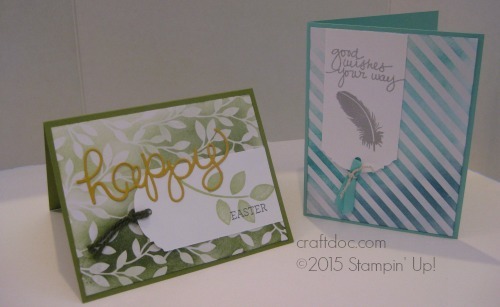 The Irresistibly Yours Designer Series Paper has the resist already embossed on the paper. You just add ink in any color you like by sponging or spritzing. -Create an ombre look by using different shades of the same color. -Wipe off excess ink with a tissue. -This paper is not for sale – you can only get it FREE with a $50 order at my website shop. -Stamp sets used were Crazy About You and Lovely Amazing You. -The Whisper White panels were cut with the Ornate Tag Topper Punch.